Raised over a platform . 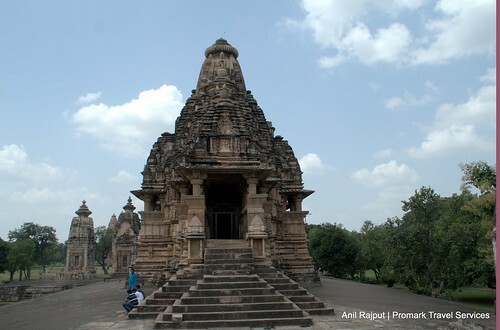 This temple is dedicated to Lord Shiva, has an exquisite marble Shivalinga (it originally housed an emerald lingam) as the main deity. 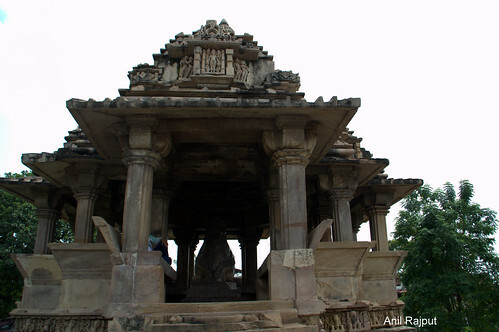 It is believed that the temple celebrates the celestial marriage of Lord Shiva with Parvati. 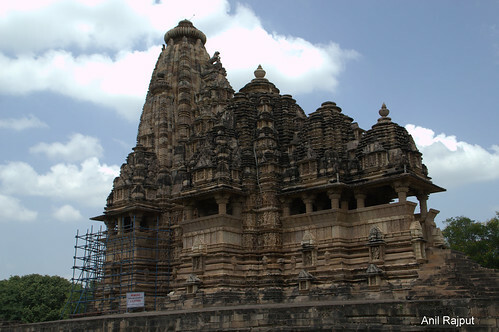 An imposing image of the three-headed Lord Brahma also is enshrined in this temple. With lions adjoining the northern and elephants the southern steps , human figures are also depicted on both side of elephant the exterior of temple walls are with Apsaras writing letters, playing music and a lovely one plucking a thorn from her foot, women are seen to caress a baby . On one of the walls there is a four-armed dancing Lord Ganesh, holding an Axe and broken tusk , in his right hands, and with his left hands holding a laddu (sweet) and extended in a boon-granting gesture. 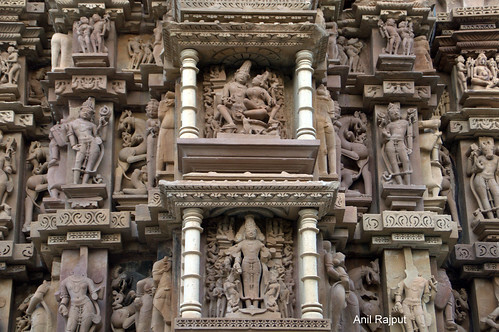 The sculpture of Lord Shiva ( with Trishula on right shoulder and snake on left shoulder ) can also be seen on outer wall . Nandi Temple is dedicated to Nandi Bull the vahan ( mount) of Lord Shiva , situated opposite the Lord Vishwanath Temple of Love in Khajuraho, as a common architect plan any temple of Lord Shiva is having Nandi as protecting the gates sitting facing the temple, this temple was constructed in 11th century along with the Vishwanath Temple of Love , by the Chandela King, Dhanga Deva . The temple stands upon a rectangular platform the main structure is combinations of cross and rectangles with a small hall with three side balconies . 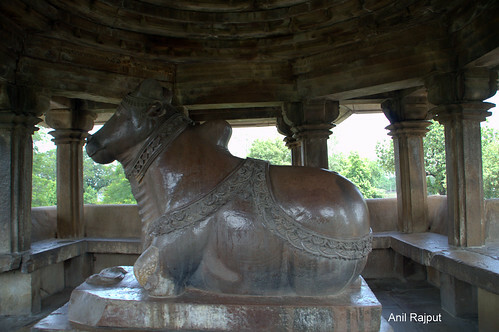 The main Monolithic idol of richly harnessed the Nandi is 2.2 mtrs. long and 1.8 mtrs. tall the roof is resting on plain sand stone pillars ,The beautifully carved exteriors of the temple are decorated with images of Apsaras , Elephants and soldiers are the charm and beauty of this temple.